Everyone does the My First Time Tag. I decided I want to do a beauty edition. There are so many firsts in beauty. I’ve come up with a handful of beauty first to make this Beauty Edition of this tag. Please feel free to do this tag yourself. Please just link to this post in yours or in your video description if you do this tag in a YouTube video. 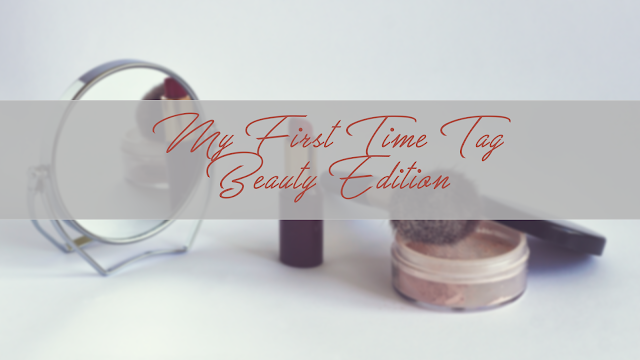 I have come up with 6 beauty firsts for this tag. So here it goes. 1. First hair dye experience? My sister gave me highlights with Lighting Bleach for the new school. Right after I washed the dye it looked like all of the roots on the top of my head were bleached. I was so freaked. I cried. I thought it looked so stupid. My sister assured me it would look fine the next morning. When I woke up it looked like it was supposed to. I was so worried but it ended up looking great. I was about 12 at the time and haven’t stopped dying my hair since. I was finally allowed to use makeup in 6th grade. I just did eyeliner at first. Only thing is I went straight to liquid liner. I learned how to cat eye pretty quickly. Though it looked a little weird without tightlining and the sides were always a little uneven. The first time I ever did it though I almost poked my eye out and the liner was a mess. My first hairstyle wasn’t much. It was just side swoop bands and feathered cut. It wasn’t layered but it there were bits that were shorter. That makes it sound like I did it myself but I got it done at a local salon and that is still where I get my hair done to this day. After I got it cut my sister dyed it for me. She did pink and blonde highlights and then did blonde bangs with black tips. I actually really loved it. I have been dying my hair Auburn for almost 2 years now and I’ve really been missing my colors. I might go back to colors soon. 4. First piece of drugstore makeup? My sister got me this liquid liner that was from the dollar store. I don’t remember what the name of it was. After that I got the Maybelline Great Lash Big Mascara. I loved that mascara as a kid. Now I love the Maybelline Rocket and The Falsies. 5. First piece of high-end makeup? The first high-end product I ever bought was the Lorac Pro To Go Palette. I still love this little guy. It has a bronzer, 2 blushes, and 6 shadows. Plus it has a mini angled brushes and a mini shader brush. I love those little brushes. The powders in this palette are amazing! You can click here to read my full review of this palette. Invisible Dry Shampoo and swear by it. As long as you apply it the way that it says and hold it as far away as it says it doesn’t look white and works great for oily hair! That was actually a lot quicker than I thought it would be. It was a lot of fun. Again feel free to do this tag on your blog or YouTube channel. Just please link to this blog post. 1.) First hair dye experience? 4.) First piece of drugstore makeup? 5.) First piece of high-end makeup?